Bloody Mary, Bloody Mary, Bloody Mary. Those were key words to all my middle school sleepovers. We’d go into the bathroom, shut the door, and chant Bloody Mary while staring at the mirror, knowing that after we chanted it thirteen times, Bloody Mary would appear in the mirror (and presumably scratch our faces off). However, before we made it to chant number thirteen, we’d inevitably run from the bathroom screaming in terror. We could get a full night’s entertainment out of this until the parents of whoever’s house we were staying at had to come down and tell us to go to sleep. If only we had access to the internet in 6th grade and not just a ghost story book, we could have learned the full history behind Bloody Mary and realized our chants would have been more effective if we were saying “Mary Worth.” On second thought, maybe it’s a good thing we didn’t have the Internet… we got in enough trouble with a phone on which we could make prank calls. After our Bloody Mary and prank call fun, it was inevitable that each and every middle school sleepover turned into some kind of massive fight with the room splitting in half and people bringing their sleeping bag to one side or the other, refusing to speak to the other. Please tell me this wasn’t just my group of 12-year-old friends. The Sriracha Cookbook . 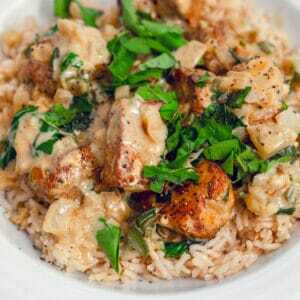 And I’m planning on making basically every recipe from it. Starting with the Bleeding Mary. The method is simple and smart. 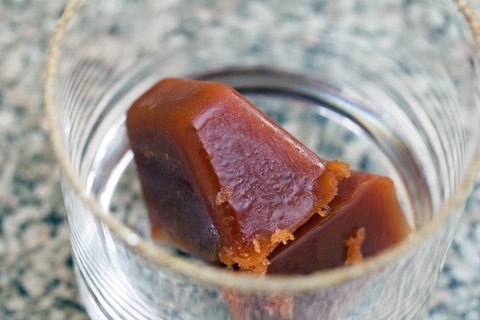 Make Bloody Mary ice cubes, pour your vodka over the top, and leisurely enjoy your brunch cocktail. Or your evening Cocktail Friday cocktail. 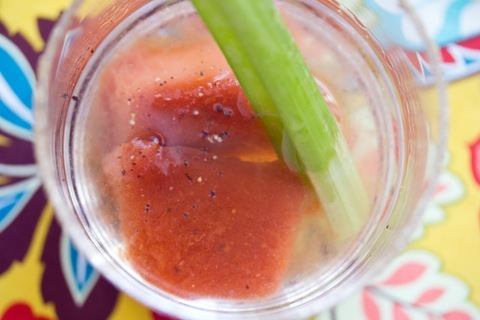 Because let’s face it, Bloody Marys are for more than just brunch. 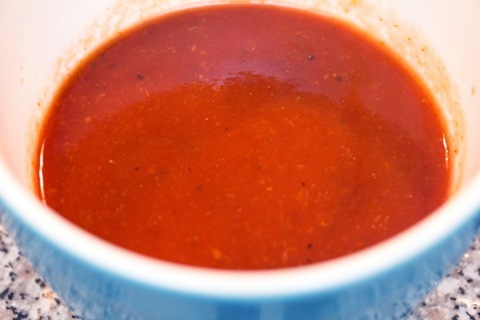 Mix together Bloody Mary mix, sriracha, and Worcestershire sauce in a medium bowl. 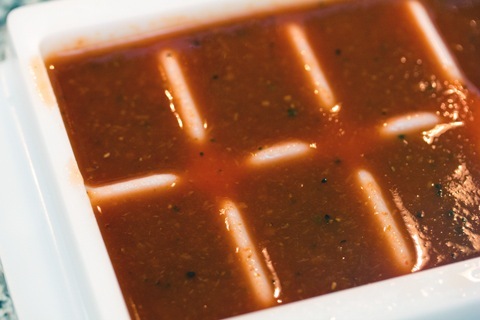 Pour into an ice cube tray — you’ll likely get 6-7 ice cubes with the mix. Pop in freezer for about 2 hours, until thoroughly frozen. 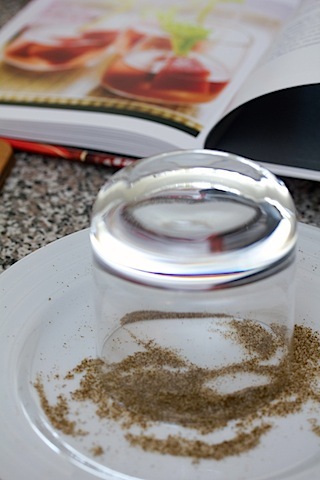 Put celery salt on a small plate. Rim glass with lemon wedge and place glass upside down on plate to cover rim in celery salt. 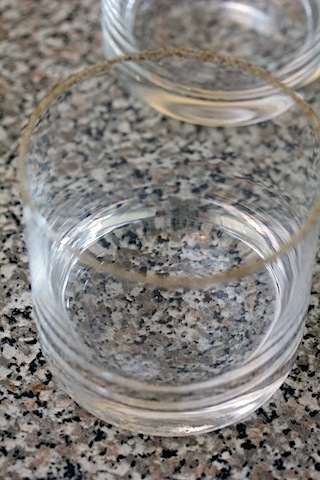 Now, place 2-3 ice cubes in your glasses. And pour vodka over the top, 6 ounces in each glass. Sprinkle freshly ground black pepper over the top and garnish with a celery stick. Brunch is ready. Oh, you wanted food? Well, do tomatoes and celery count? I vote yes. Why not get your veggie fix in first thing in the morning? Really, though, this drink is not for the faint of heart. 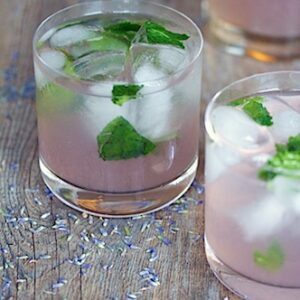 You’ll want to let your ice cubes melt a bit as you slowly sip. You’ll actually want the ice to “water” your drink down a little bit with this cocktail. How fun is that? I’d totally stare in the mirror and chant “Bloody Mary” or “Bleeding Mary” over and over again if it meant this would jump out at me. My 12-year-old self would be so disturbed that Mary and I have such a great relationship these days. But it just works. Did you ever try the “Bloody Mary” game as a kid? 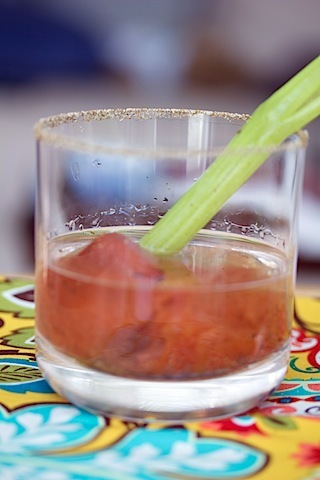 And do you love Bloody Marys as an adult? 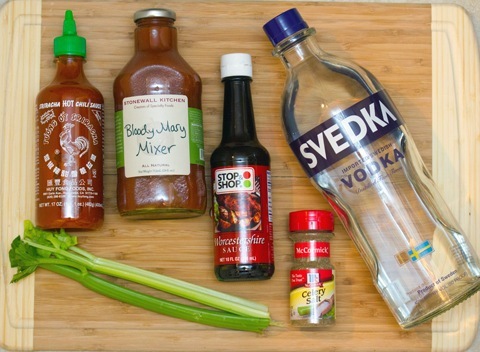 11 Responses to "Sriracha Bleeding Mary"
I was really disturbed by the title of this post. My poor sleep deprived brain just couldn’t make sense of it. But thank you for reminding me I wanted to buy that cookbook for my husband! I’m not a huge bloody mary fan, but he is, and the man LOVES his rooster sauce! This is genius!! The ice cubes in the vodka! I definitely played that “game” as a kid….so crazy! 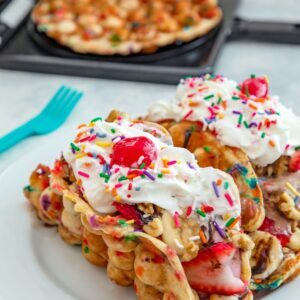 I totally put that cookbook on my Amazon wishlist..and did you know they’re coming out with a vegetarian version of it in July? WIN. Ugh I hated that game. 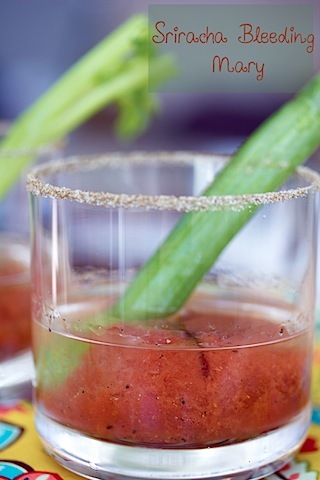 Though I love this bloody mary idea! 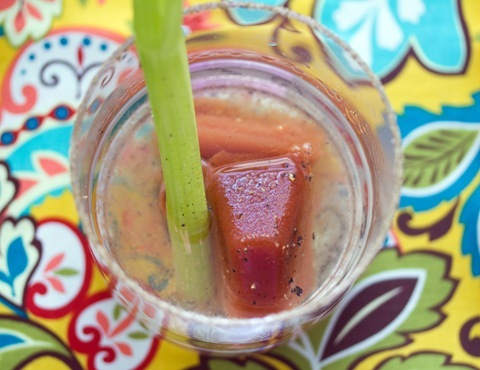 I’ve never used sriracha in my bloody mary’s, but clearly that needs to change! I love your description of 6th grade sleepovers. 4th grade was the big sleepover year for me and my friends, and ours pretty much always ended just as you described. The fight was usually between the group who wanted to stay up and do things like play bloody mary, and the group who just wanted to sleep! So funny… I think all sleepovers were like that. I remember so much drama and splitting into groups too. This is such a fun idea with the “ice” bleeding into the drink. I never ever would think to do this but I really love the idea. Just be careful not to drink all the vodka before the ice melts!! 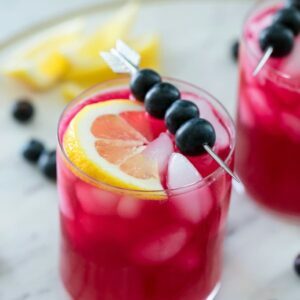 These are a fun brunch party cocktail. I love the idea of making the mix into ice cubes! I also used to play that Bloody Mary game when I was growing up. 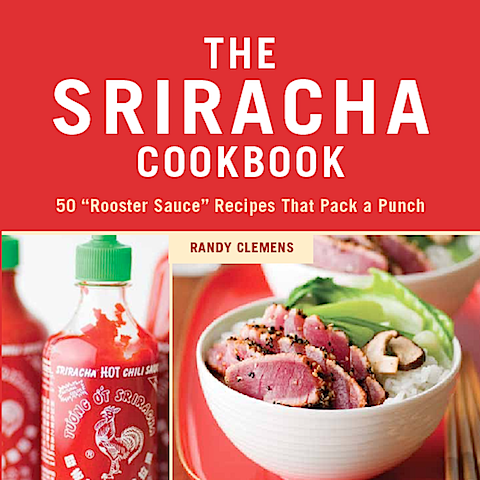 I totally bought this book for my sriracha-loving husband. He’d love this cocktail! This post was so funny! The drink sounds great and the humor awesome! Thanks for making me laugh.